The Trouble with Online Quizzes – It's Covarr! But let’s ignore the formal definition of a quiz, and look more closely into what’s actually happening. If you’re not answering any questions, how can these sites possibly know which breakfast cereal you are, or what year you should have been born in, or whatever they claim to be telling you? Simple. 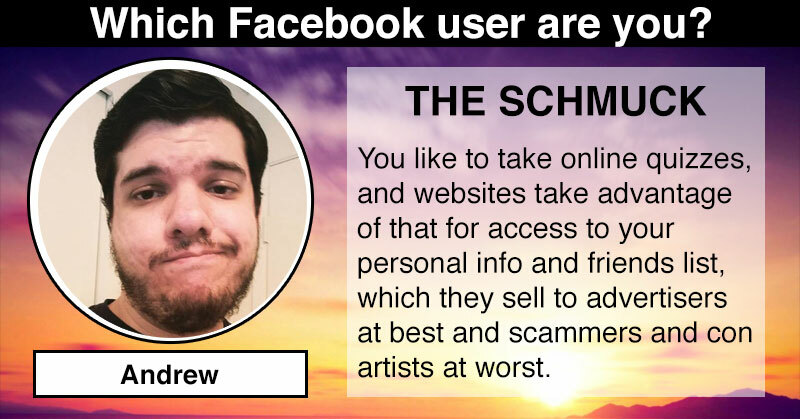 They base it on info taken from your Facebook profile. At least they don’t ask for your social security number. I’ve highlighted the important bits here. Some of this is innocent enough. They use the photos to generate the results screen. They use the friends list to give answers to questions like “Who is your most loyal friend?”. 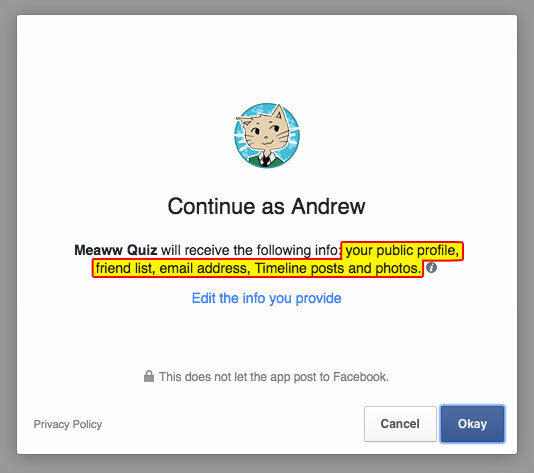 And supposedly the timeline posts and public profile are used to help calculate a correct answer; they even say as much if you click Cancel and try to continue without providing your information. But wait: The quiz I used for this example wasn’t one about my friends! It was “Which pet suits your personality?”. There’s no reason for that to know my friends. And my email address? Why on earth would they need that? They are selling your info. Your email address, your profile info, etc… that all gets sent on to advertisers and stuck into big databases full of the personal information of hundreds of thousands of people, if not millions. Those scummy emails you get for discount prescription drugs? This is why you get them. Those calls you get claiming you’ve won a hotel stay or something? This is where they get your number. So next time you feel tempted to find out what variety of wine you are, remember, that free “quiz” isn’t free. Are you willing to pay with your privacy?